Steve McClaren's former mentor Jim Smith says luck has been one of the key ingredients behind his success. But that is just one part of why Oxford boss Smith, who recruited McClaren as his right-hand man at Derby in 1995, feels he has landed the England job. Smith told BBC Sport: "One thing that makes him a good coach is he's lucky. "But he's a very talented coach and very good at man-management. He knows what the best footballers are all about and gains their respect." Smith added: "He's up there with the best in coaching terms, his knowledge of the game and the mentality aspect. "But luck has also played a part. You only have to look at their two last matches in the Uefa Cup when they staged great comebacks. He's either a genius or very lucky." Smith is delighted to have played such a large role in the shaping of McClaren's coaching career. 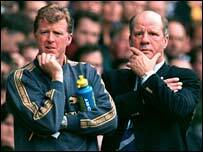 For it was Smith, affectionately known as 'The Bald Eagle', that first unearthed McClaren, 45, in 1995 when he appointed the former Middlesbrough boss as his right-hand man at Derby. Up until then, McClaren, who was forced to end his playing days in 1992, was coaching Oxford reserves. Smith said: "I brought him to a top club from Oxford where he was working as a youth-team/reserve team coach to make him first-team coach at Derby. "It was a massive jump, but he took it in his stride and I knew that he was going to be a top man." The much-travelled Smith, who before switching to Oxford was assistant to Harry Redknapp at Portsmouth and Southampton, admits the partnership did not get off to the best of starts. "We (Derby) struggled and the fans were shouting for us to get the sack after three games. "They were getting a bit impatient but then we signed Igor Stimac in November and we hardly lost another game all season on our way to promotion." Smith acknowledges that McClaren played a big part in that first season in the Premiership when they finished 12th. But their time working side by side was to come to an end four years later when Manchester United chief Sir Alex Ferguson came calling to replace his departing aide Brian Kidd. "It was disappointing to see Steve leave," Smith said. "We could have stood in his way but we didn't want to. "His luck was in again, though, because he left in February and went on to win the treble that season." 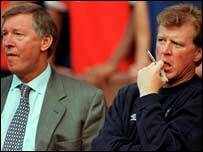 McClaren, however, will be hoping his luck rubs off with England when he assists Sven Goran Eriksson at this year's World Cup in Germany before taking over the reins full-time. Will Steve McClaren make a good England manager?